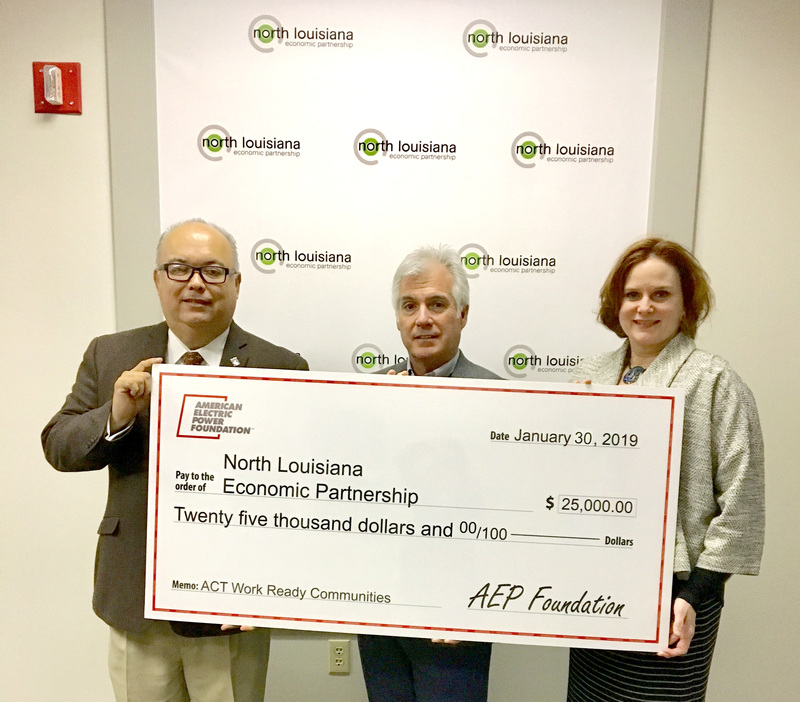 Southwestern Electric Power Company (SWEPCO), an American Electric Power company, presented a $25,000 check Wednesday on behalf of the AEP Foundation to North Louisiana Economic Partnership (NLEP) President Scott Martinez and NLEP Senior Vice President of Workforce Initiatives Angie White to support the ACT Work Ready Communities initiative in Northwest Louisiana. The ACT Work Ready Communities Initiative in Bossier, Caddo, DeSoto and Webster parishes involves the participation of over 20 organizations from local government, K-12 education, post-secondary education, workforce development, economic development, non-profits and the business community working on common goals to measure and close our regional skills gap. The regional team is working to certify the four parishes as ACT Work Ready Communities. The program is based on the ACT WorkKeys National Career Readiness Certificate. In order to become certified, each parish must meet specific goals for the number of workers who earn a WorkKeys Certificate and the number of employers supporting the effort. What began as a four-parish initiative led by NLEP in 2017 now includes Morehouse, Ouachita and Richland parishes. Several other North Louisiana parishes are expected to join the team over the course of 2019. This impressive collaborative group, now involving over 35 organizations across the region, has branded itself North Louisiana Ready2Work. The funding provided by AEP will be used to administer the WorkKeys testing and preparatory training for test-takers that are not already covered by existing funding sources. Currently, the State of Louisiana pays for high school students in the Jump Start Career Diploma pathway to take the ACT WorkKeys test, which measures a person’s readiness for a career in three foundational skill areas: applied math, graphic literacy and workplace documents, which measures reading comprehension and the ability to follow instructions. However, segments of the workforce, including unemployed residents and adult education participants, must pay the test fee out-of-pocket. The grant will help to cover their cost. It will also be used to develop a market study assessing the top occupations in North Louisiana that pay a living wage and are projected to stay in demand for the foreseeable future, along with their corresponding WorkKeys scores. The North Louisiana Ready2Work team will use the results of this study to train educators, counselors and others working with job seekers on how to use the WorkKeys system to find a good career match based on their foundational skills. Over the last two years, over 4,500 high school and college students in the four Northwest Louisiana parishes have earned a WorkKeys certificate. The North Louisiana Ready2Work team is working aggressively to educate regional employers on how to use this valuable tool in their recruitment, hiring and promotion processes. More information can be found at www.NorthLouisianaReady2Work.org.